Aboriginal undergraduate students with an interest in renewable energy systems or sustainable and energy efficient buildings from any institution may apply but they must hold their awards at one of four SERA participating institutions (Queen’s University, University of Manitoba, University of Ottawa and the Royal Military College of Canada) at the time of taking up the award. The award is $1500 per term (50 hours research experience with a SERA researcher). The deadline is December 10, 2018. Please fill out the Word file application form and send it to sera@queensu.ca. NSERC CREATE SERA is a unique training program focusing on sustainable engineering in remote areas that offers a one-of-a-kind experience through training, research and industry internships. For more details or to join our mailing list, contact sera@queensu.ca. 2018 Annual SERA Workshop - Sept 19-22. Register for the 2018 SERA Annual Workshop! The 2018 annual Sustainable Engineering in Remote Areas (SERA) workshop will be held at Queen's University on September 19-22. This event will gather the SERA trainees and the academic supervisors as well as our industry collaborators. The main public day is Thursday, September 20. This year we will also have an Industry Showcase on Thursday, September 20. This event is created specifically for trainees to give them a better chance to meet and interact with the industry collaborators to set up their internship. If you have not registered for this workshop, please follow the Registration Link. Please let us finalize our logistic plans for the workshop in time and provide an incredible scientific and social gathering experience for you. Directions to the workshop location: The John Deutsch University Centre (JDUC) is located at the northeast corner of University Avenue and Union Street. When entering the building from the Union Street (as marked in the attached map), take the stairs to the second floor. You will find the McLaughlin & Sutherland halls on your right. There will be signs on the walls to guide you. Below, yo can see the marked location that the Workshop will be held. The NSERC CREATE Training Program on Sustainable Engineering in Remote Areas (SERA) is targeted at graduate students and undergraduate Aboriginal students with an interest in renewable energy systems or sustainable and energy efficient buildings. Graduate students must be enrolled at one of the four participating institutions (Queen’s University, University of Manitoba, University of Ottawa and the Royal Military College of Canada) at the time of taking up the award. Undergraduate students from any institution may apply but they must hold their awards at one of the four institutions. Graduates of the SERA program will be well‐equipped to become leaders in their fields as a result of the unique training they will receive through seminars and workshops, high‐level research projects, industry internships and first hand visits to remote Indigenous communities. All applications must be received no later than 4:30 pm EST on March 3rd 2017. 2016 Annual SERA Workshop - Sept 21-24 2016. VIDEO: Mark Green, SERA program leader, talks about Aboriginal Access to Engineering and working with Aboriginal Communities in convocation speech. 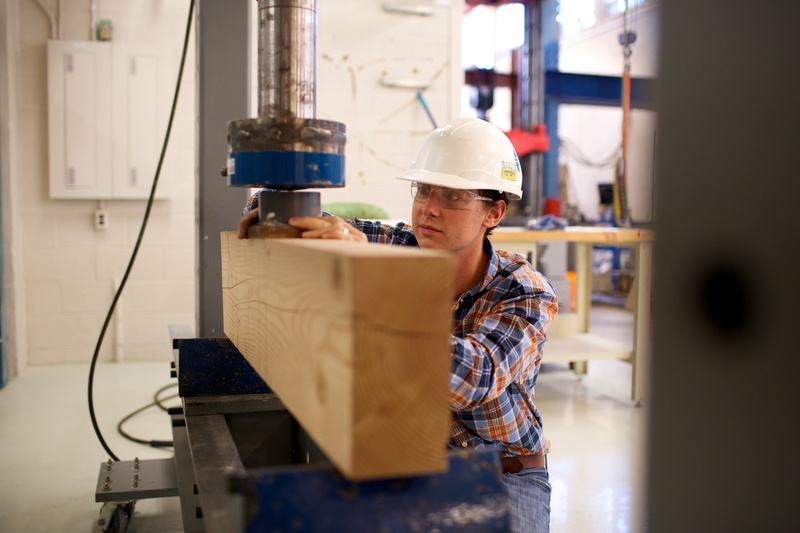 MASc Candidate Manoah Gutknecht with a a timber beam in the Queen's University Structures Lab. Undergraduate students Oke Maracle and Haven Moses working with a materials testing machine at Queen's University. Using wall panels constructed from straw bales and plaster is one way to make buildings more sustainable. (Photo courtesy of Dr. Colin MacDougall, Queen's University). PhD Candidate Mehdi Mirzazadeh checks for cracks in a reinforced concrete beam subjected to cold temperatures and instrumented with Fibre Optic Sensors. Dr. Duncan Cree in the structures lab at Queen's University investigating the behaviour of alternative building materials under high temperature. SERA trainee Dao Xiang (University of Ottawa) is investigating advanced sensor technology for efficient monitoring of buildings. Dr. Andrew Pollard (Queen's University) is investigating alternative energy sources like biomass for a more sustainable future. Wind turbines are one form of renewable energy being studied by SERA researchers. How does snow cover affect the efficiency of photovoltaic solar panels? This is one of many research studies of the Applied Sustainability group at Queen's University. Md Anamul Hasan, MSc. candidate at the University of Manitoba, is researching dielectric sensing technology to monitor the hydration criteria of cement-based building materials for cold regions.